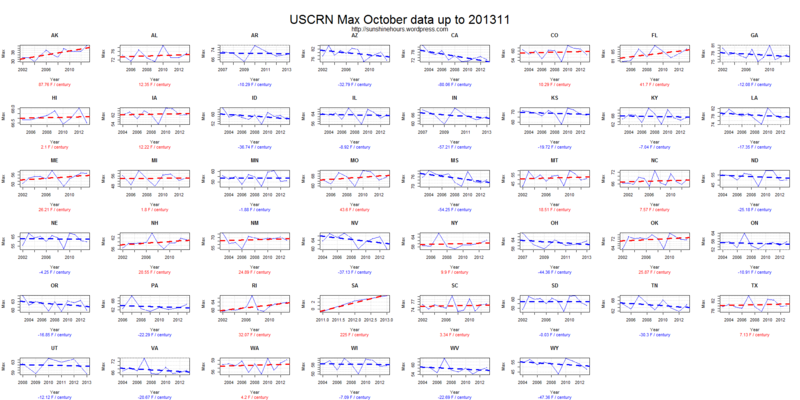 USCRN TMax/Tmin/Tmean October 2013 – Russia is Warming at 225F / Century? The USCRN is the US Climate Research Network. I had not looked at the data in a little while. So I was confused by the state code of SA. Well, it turned out that the NOAA has added a station in Tiksi, Russia. Which has been warming (Tmax) at 225F/century over the last 3 Octobers. The USCRN has no stations in Connecticut or Delaware or New Jersey, but it now has one in Russia. Bizarre. Anyway, the data is not that old, but here is the USCRN Tmax, Tmean and Tmin trends for October for most of the states in the USA and Tiksi. The USCRN is a new ‘state of the art’ United States Climate Reference Network. There are 222 stations of which 220 have data for April 2013. Of those 222, only 137 have 5 or more years of data. I’ll be using the 137 list. 41 of those 137 had April 2013 as the coldest April. 9 of those 137 had April 2013 as the warmest April. Stations with April as Warmest. USCRN vs NOAA September 2012 update. 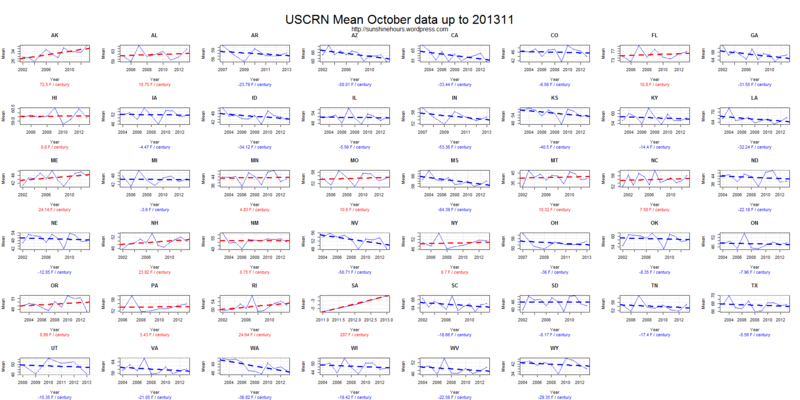 This is the monthly Mean from both NOAA and USCRN for September 2012 for the 48 continental states. 16 states show USCRN stations warmer than NOAA (bold) and 32 show NOAA warmer than USCRN. NOAA – USCRN = NOAA state temperature average minus USCRN state temperature average. Ignoring area weighting, the NOAA temperature averaged 0.80F warmer than USCRN. USCRN vs NOAA August 2012 update. (I’m late because USCRN didn’t post August monthly temperatures until October 3rd after they posted September data). This is the monthly Mean from both NOAA and USCRN for August 2012 for the 48 continental states. 14 states show USCRN stations warmer than NOAA (bold) and 34 show NOAA warmer than USCRN. Ignoring area weighting, the NOAA temperature averaged 0.83F warmer than USCRN. This is the monthly Mean from both NOAA and USCRN for July 2012 for the 48 continental states. 9 states show USCRN stations warmer than NOAA (bold) and 39 show NOAA warmer than USCRN. Anthony Watt from WUWT mentioned the USCRN in a recent post. So, I thought I would take a look at the monthly TMAX data (T_MONTHLY_MAX). I downloaded all the monthly files. If there was enough data: I calculated an anomaly for each month for each station based on 2005 to 2009 mean. 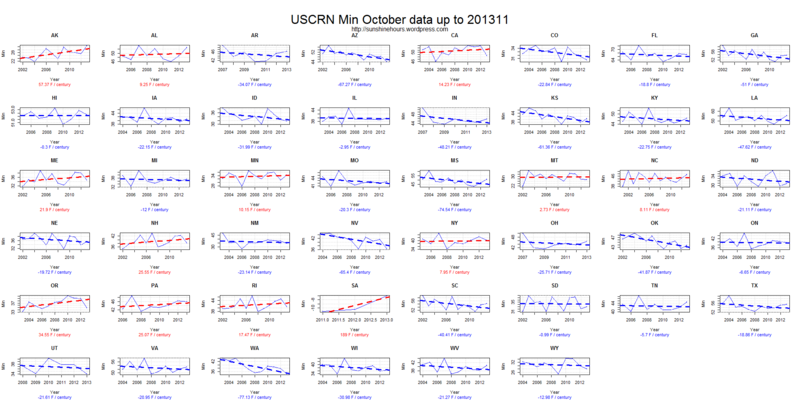 Yes, thats a short period, but the USCRN hasn’t been around long. I graphed the data. And I calculated the Trend for data from 2007 on. Here is the trend for each station (with enough data) sorted by highest trend to lowest. There are a few graphs at the bottom.